Art Deco is the term given to the decorative and architectural style from 1919-1939. Art Deco’s geometric designs, accompanied with playful ornamentation contrasted with the earlier organic forms of the Art Nouveau Movement. Unlike modernist design, Art Deco was not overly concerned with issues of functionality or technology. Art Deco was primarily a fashion oriented style. Art Deco style was popular for hotels, theaters, restaurants, ocean liners and World’s Fair exhibits. By the 1930s, Art Deco style in the United States was adapting to mass production rather than the luxurious products originally shown at the Paris exhibit Les Arts Decoratifs. 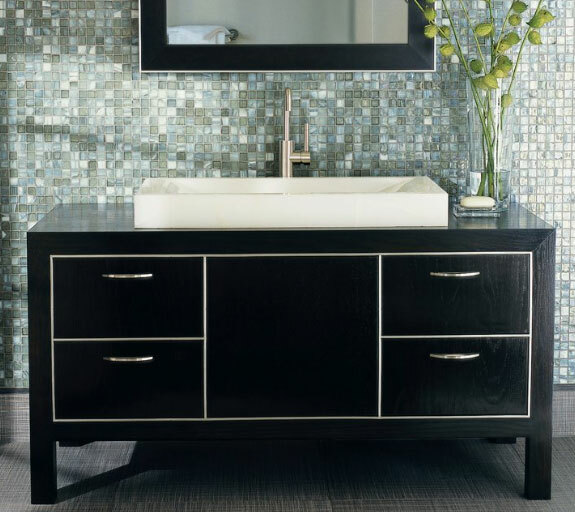 Walker Zanger’s Luxe Vanity recalls the 30’s Art Deco style with it’s rich Espresso finish and brushed-nickel accents. This large single bowl vanity available in honed marble or white onyx will make a grand statement in your bathroom retreat.